College students stand behind Pres. 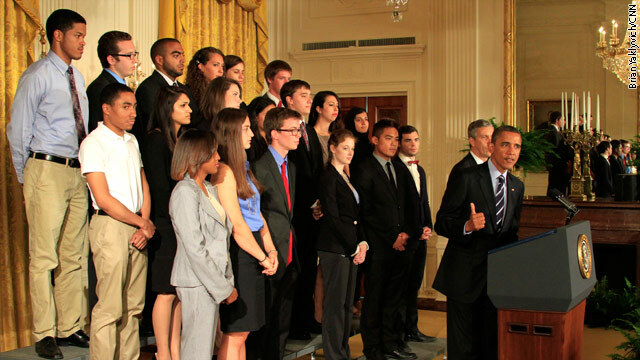 Obama and Secretary of Education Arnie Duncan in the East Room of the White House as the president calls on Congress to stop interest rates on student loans from doubling. WASHINGTON (CNN) - With time running out for Congress to prevent a doubling of interest rates on federal student loans, the White House and Republican leaders exchanged accusations Thursday on who was to blame for the lack of an agreement. President Barack Obama chided Republicans for holding up a deal with unreasonable demands, and he urged college students to continue raising their voices on the issue. However, spokesmen for Republican leaders in the House and Senate denied an assertion by press secretary Jay Carney that the White House has been working with them to try to reach a deal. Asked about GOP complaints that the White House has not reached out to Republicans on the issue in recent days, Carney said that "we are actively working with members of Congress to get this done," adding, "in both parties." Spokesmen for House Speaker John Boehner, R-Ohio, and Senate Minority Leader Mitch McConnell, R-Kentucky, disputed Carney's account. On the Senate floor, McConnell accused Obama and Democrats of playing political games on the issue. "It is the Democrat-led Senate that has failed to act and the president who has failed to contribute to a solution, and the reason is obvious," McConnell said. "It was reported yesterday that the Democratic Congressional Campaign Committee is launching a website with a student loan countdown clock aimed at raising money off this issue. The implication is that Republicans are the ones dragging their feet. " 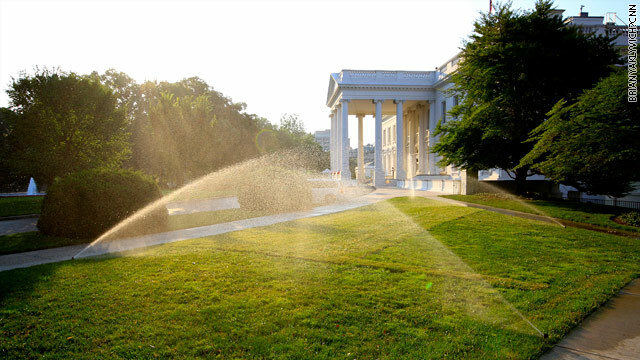 It's going to be a scorcher in D.C. today and the White House grounds staff started watering the lawn early this morning. Today, President Obama and his administration (mainly Press Secretary Jay Carney) are surely to be grilled on yesterday's claiming of executive privilege and the vote on the Hill to hold Attorney General Eric Holder in contempt. But the president will be focusing on student loans and trying to prevent interest rates from doubling at the end of the month if Congress doesn't act. He was in Las Vegas earlier this month, touting his plan to students at UNLV where he argued that it will cost students up to $1000 extra if Congress doesn't pass legislation to prevent the doubling. “I just said to Congress, get this done. Get it done. Get it done. This is not complicated. Last month, Democrats in the Senate put forward a plan that would have kept these low rates in place, wouldn't have added a dime to the deficit. The Senate Republicans got together, they blocked it. They said, no. House Republicans voted to keep your rates down only if we agreed to cut things like preventive health care for women. So that's not a smart thing to do,” Mr. Obama said two weeks ago. So we expect him to say more of the same thing today when he holds an event in the East Room to continue to put the pressure on Congress. LAS VEGAS (CNN) - President Obama is trying to use the success of social media to get his proposal to prevent interest rates on student loans from doubling at the end of the month. While speaking to a crowd of 2,500 on the campus of University of Nevada-Las Vegas, he urged students to pressure Congress for action by writing on their Facebook walls, and tweeting with the hashtag #dontdoublemy rate. Iowa City, IA (CNN) –– President Obama targeted House Republican Todd Akin from Missouri in his remarks on student loan interest rates at the University of Iowa Wednesday. He did not call out Akin by name, instead citing Akin's recent remarks about how the federal government should not be in the business of student loans. "America has got the equivalent of the stage three cancer of socialism because the federal government is tampering in all kinds of stuff it has no business tampering in," Akin said in a debate with his two Republican opponents Saturday, according to a report by the Columbia Daily Tribune. Akin, who represents suburbs west of St. Louis, is in a Republican primary contest to oppose Sen. Claire McCaskill (D-MO). She is facing perhaps the toughest re-election fight of any incumbent Democratic senator this cycle. 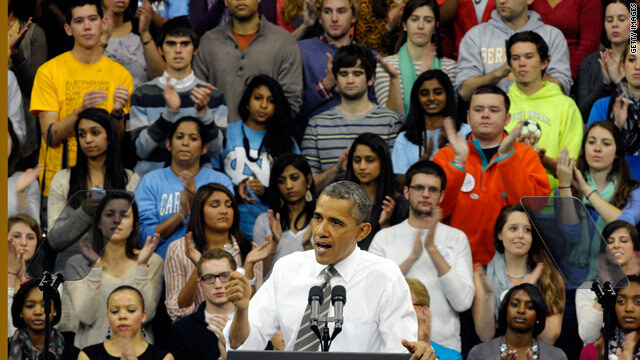 Boulder, CO (CNN) - President Obama kicked off a tour of three battleground states today with a speech at the University of North Carolina at Chapel Hill. This two-day college blitz is, on it's face, about pressing Congress to prevent interest rates on federally subsidized student loans from doubling this summer. In political reality, the president's latest excursion from Washington is all about energizing part of his base – youth voters – in an election year. 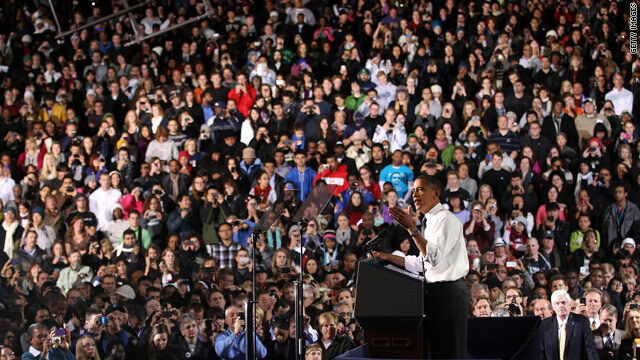 "For each year that Congress doesn't act, the average student with these loans will rack up an additional $1,000 in debt - an extra $1,000," President Obama told a supportive crowd of mainly students at UNC Chapel Hill. "That's basically a tax hike for more than 7 million students across America, more than 160,000 students here in North Carolina alone." In 2007, with bipartisan support, a Democratic-led Congress cut interest rates on Stafford loans from 6.8% to 3.4%, the current rate. On July 1, that rate is set to return to 6.8% for new loans. As some congressional Republicans voice concern about the $6 billion price tag for maintaining the low rates, the White House is coordinating with congressional Democrats to frame Republicans as threatening to raise costs on college students. On Monday, presumed Republican presidential nominee Mitt Romney gave a full-throated endorsement of extending the low interest rates, trying to blunt the president's momentum on the issue. Congressional Republicans accuse President Obama of trying to distract from his performance on the economy and point out that under the president's own budget proposal student loan rates would double in 2013. In 2008, 66 percent of voters age 18 to 29 voted for Obama. Thirty-two percent went for Sen. John McCain. The latest CNN/ORC poll shows a similar breakdown among young people in an Obama-Romney match-up, but a number of polls show an enthusiasm gap for Obama among young voters compared to 2008 when they flocked to cast ballots in unprecedented numbers. 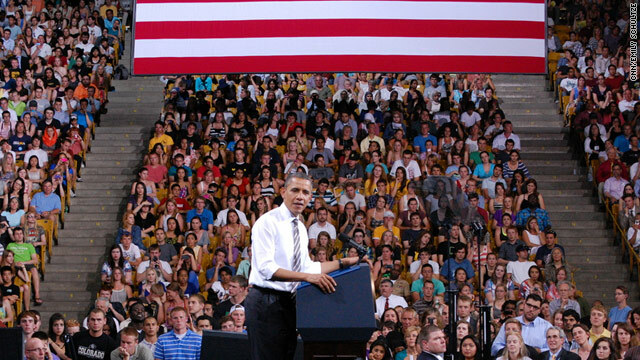 President Obama is scheduled to speak at the University of Colorado Boulder Tuesday night. On Wednesday he addresses students at the University of Iowa. DENVER (CNN)— More and more college students are facing tuition sticker shock. A new report by the College Board Advocacy & Policy Center shows the average cost of tuition and fees at four year institutions jumped to 8.3 percent this year. That’s more than twice the rate of inflation. For many young people that translates into bigger loans and more debt at a time when it's hard to find a job after graduation. Against that backdrop President Obama flew to Denver, Colorado to push a plan that he says could help 1.6 million people save hundreds of dollars a month. “We should be doing everything we can to put college education within reach for every American,” the president said during a campaign style event on the Denver campus of the University of Colorado. Rita Whittington, a special education major who jokingly feels she has already earned a degree in student loans, says it's a burden. “I've taken out extensive loans. First I educated my children, three of them I sent to college,” she told CNN. “ So I have parent loans and now I have student loans. So this is extremely costly for me."